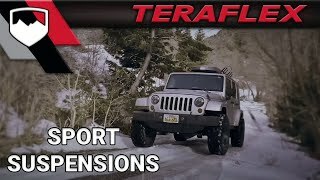 Developed for the Jeep enthusiast looking for highway stability and trail performance in a no compromise package, the 2.5” Sport ST2 Suspension System builds on the 1.5” Sport ST1 by adding preset front lower Sport flexarms, a heavy-duty forged adjustable front track bar, rear track bar bracket, and more. The additional ground clearance allows for fitment of larger diameter tires without compromising on- and off-road prowess. No alignment is needed thanks to the preset front lower Sport, heavy-duty adjustable front track bar, and rear track bar bracket, which optimize correct caster and pinion angles for 2.5” lift heights. The Sport ST2 Suspension System can be installed on Friday, wheeled on Saturday, and driven to church on Sunday!